Snow snow snow snow!!!! Winter is not giving up in Kansas City with predictions of 10 to 15 inches of snow and zero visibility. Plus, we are not just getting metric boat loads of snow, but…. (cue deep booming echoing voice) THUNDER SNOW. It sounds more like an X Men character or superhero name or maybe they should add this as the next movie in the Mad Max movie serious….Return of Thunder Snow….anyone? come on! It’s really strange to see the light snow falling and hear booming thunder outside. They have canceled and closed everything around here including schools, work, gyms, ceremonies. The grocery stores have been like war zones the last few days with people stocking up for Snowmeggedon. So now there is nothing left to do but hunker down, cook up a hearty breakfast, put a fire in the fireplace, add a roast in the oven to cook low and slow, and cuddle with my favorite boys…Guinness and Kiley. Even if you aren’t getting (booming voice) THUNDER SNOOOOOW…. you can still make a heart-warming breakfast that deserves being stranded in a snowy mountain cabin with a warm fire in the fireplace. My local Community Supported Agriculture (CSA) meat supplier provides us with 12 to 16 oz bone-in ham steaks. We like to brown these in a cast iron skillet for breakfast. In the summer, I like to cook these steaks on the grill. 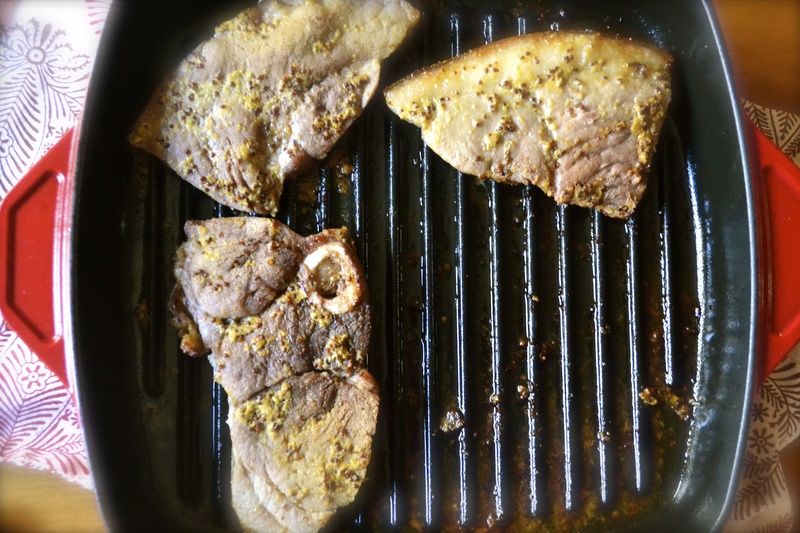 When cooking indoors in a skillet, I cut the ham steak into four equal portions to cook evenly and quicker. A simple Dijon sauce and butter-sauted apples pair well with the ham. This is even good as a quick dinner. In a small bowl, mix whole grain mustard and Dijon mustard. 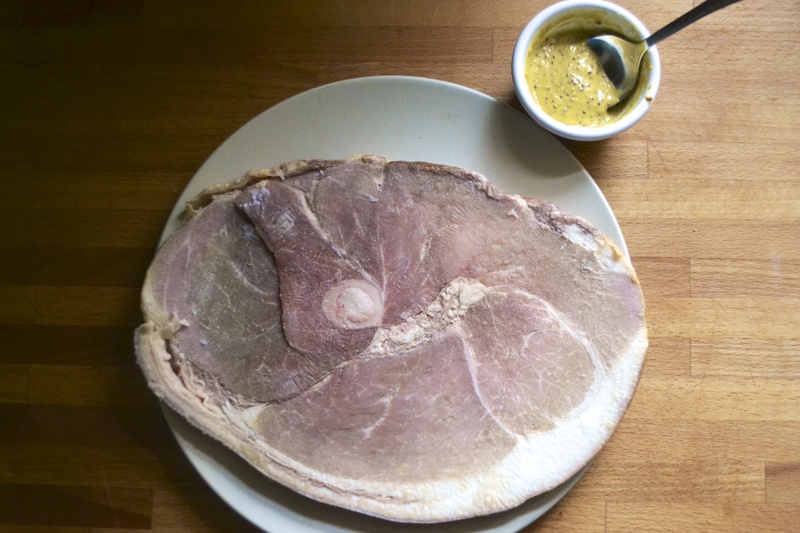 Spread mustard mixture on top of ham steak. Heat 1 tablespoon butter in a skillet over moderately high heat. Add ham steaks to skillet and sauté until browned (about 5 to 6 minutes). If your ham steak is thicker than 1/4-inch, cook a little longer. Transfer browned ham to a heat-proof dish, loosely covered with foil, and place in preheated oven to keep warm while apples cook. Add remaining tablespoon butter to skillet and sauté apple slices, turning once, until golden and tender, about 4 minutes total. Remove ham from oven. 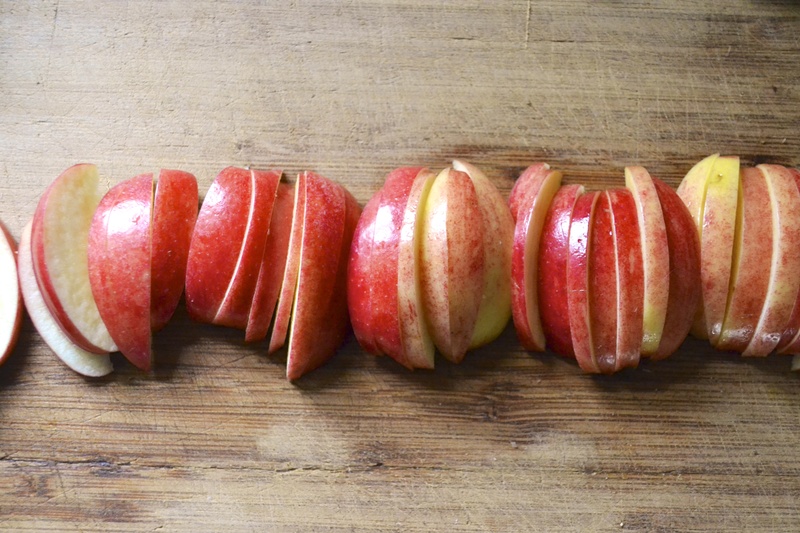 Top each piece of ham with apple slices. 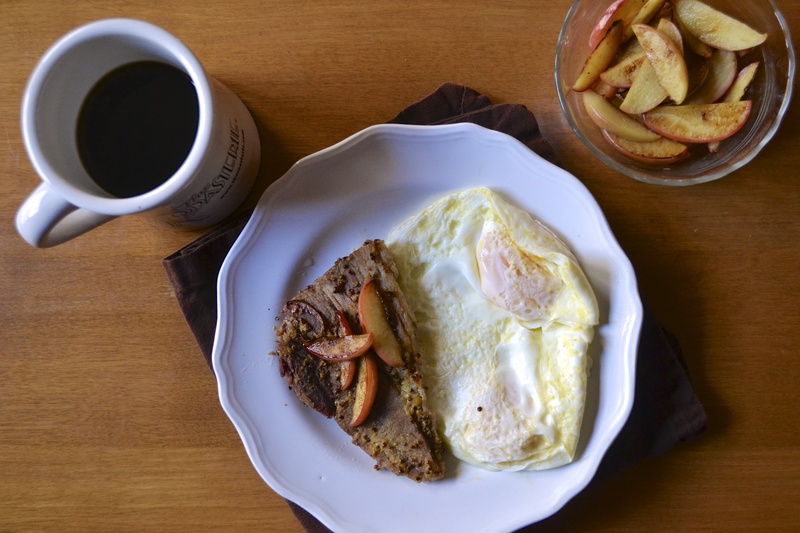 Serve with fried eggs for a fabulous fancy country breakfast.